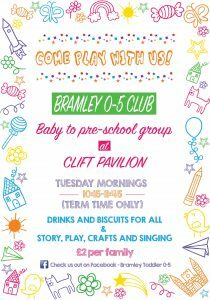 Bramley Toddler Group is a small, friendly group who meet every Tuesday from 10.15-11.45 during term time at The Clift Meadow Pavilion in Minchens Lane. There is a lovely mixture of mums, dads, grandmas and children aged from just a few weeks old up to 4 years old. Everyone is welcome and it’s always great to meet new people. As well as the children having a great time playing with all the toys, it’s a brilliant opportunity for the adults to socialise and chat over a cuppa! We have a big selection of toys and equipment from dolls to trains, to slides and seesaws, a play kitchen and a massive collection of dressing up costumes. We have loads of baby toys and baby mats and bouncers so that the babies can also play safely and join in the fun. As well as the usual play activities, we regularly have guest activities such as pottery painting, Usborne Books and a photographer, along with crafts such as cookie decorating and painting. We always have story time each week and the children can spend a few minutes enjoying a biscuit and drink while sitting and listening to the story. We run as a small voluntary committee of mums and grandmas and we are always looking for new people to come on board. The main thing we need help with us opening up and setting up all the toys at the start of a session, and putting everything away again at the end. You can keep up to date by joining the Bramley Toddler 0-5 Facebook group.